I recently spoke to the Eastern Iowa Tourism Association. As we drove to the Quad Cities we passed the World’s Largest Truck Stop, which was our lunch stop as we relocated to Boston 2 years ago. I thought it would be fun to revisit the post. Enjoy! Truer words were never spoken. As we set out today, van pointed east, destination Boston, our only real goal is to arrive before Doug has to be at work Tuesday. Which leaves little time for sightseeing. With the rented minivan packed with necessities for our extended stay in Massachusetts and items that would, hopefully, keep the girls from getting too bored during our drive, we were off. 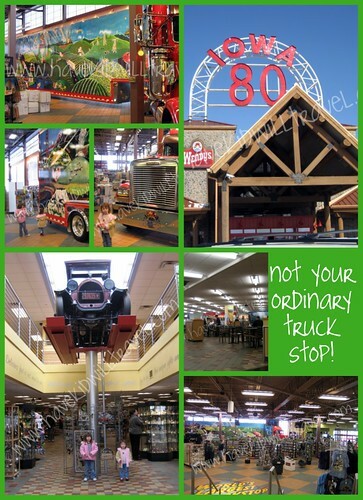 One thing you do see along the interstate, though, is truck stops. And the World’s Largest Truck Stop just happens to be located along Interstate 80 in eastern Iowa. a sit down restaurant, the I-80 Kitchen which serves a full menu of “home cookin'” and offers a hot buffet (which featured meat loaf, chicken & pork loin along with sides and veggies when we were there) and full salad bar. The buffet is $10.75 for adults, kids 5 and under are free. a showroom full of semi truck accessories. Two semi’s are there as well, one on a rotating show floor. a second floor for truckers with not only showers and laundry but a theater, dentist & chiropractor! a full service center to get any fixin’ done or add some chrome you just picked up. My little girls were fixated on everything there was to see. This is definitely a fun stop even if you’re not a trucker. And if you’re near here in July you’ll want to stop in for the Trucker’s Jamboree (check website for dates). Live music, exhibits, antique trucks and much more! This is one of my many stomping grounds from high school. I grew up about 7 miles from the truck stop, and because my small town (Durant) did not have any restaurants (other than sit down), we headed out to Walcott quite a bit for McDonald’s (across the interstate from the truck stop) and Wendy’s. 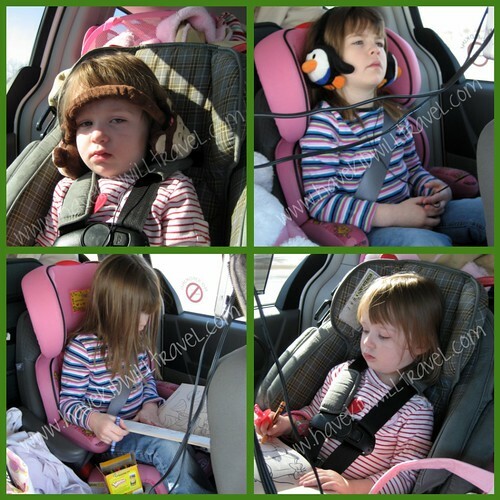 When my kids were small, we took road trips all over the place. Ok…I even used to pull the kids out of school when they were younger for road trips. Yes, they’ve flown also, but road trips are fun. I love your photos. It’s so fun to get to “visit” the blogs from Bloggy Carnival now that I have time and can read and post. Can’t wait to hear more about your adventures out East! When I saw the worlds largest ball of twine, my life will be complete.